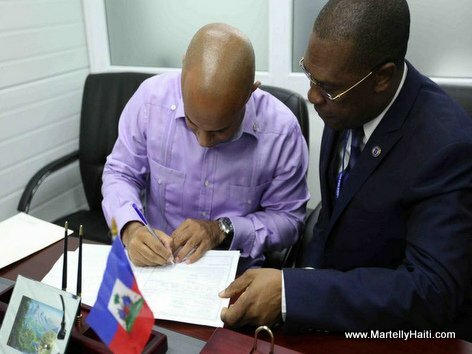 PM Lamothe ankouraje tout moun nan peyi d'Haiti pou fe menm bagay la tou. Taxes must be paid, first, by wealthy citizens. If not, taxes will be perceived as unfair and excessive by People. The first goal of a minimum wage for workers is not to collect taxes but to fight against poverty and increase consumption of goods and services. If the market is not competitive enough, (it is Haiti's situation) a minimum wage will generate inflation. An important step will be to stimulate a fair competition in importation and distribution of goods. I agree with you. Haiti needs a minimum wage for his workers so they can pay taxes. This year the Department of Taxation and Finances in Haiti should get together with CPAs, Economists, all Public Administrators in charge and the Labor Department to work on a minimum wage for the Haitian workers. Haiti needs at least 2 banks in the South, the North for the Haitians working to go banking. Haiti should build affordable housing for the Haitian workers in every department. The Haitian people needs healthcare in every department. Haiti should work on a minimum wage of least $2 an hour so the Haitian people can pay taxes to develop education, public housing, transportation, commerce, build roads in Haiti. Construire un Etat de Droit qui donne de bons services d'Éducation, de Santé et de Justice à tous ses citoyens exige une fiscalité juste et progressive. Ceux qui gagnent de gros revenus doivent être de vrais patriotes (pas des patripoches) et payer leurs dettes envers le pays et les citoyens qui font leurs richesses. Ceux qui gagnent de petits revenus doivent payer peu d'impôts pour être capable de vivre dans la dignité. Dans tous les pays les citoyens aisés et les propriétaires d'entreprises prospères tentent de ne pas payer leur juste part d'impôts. Tout État de Droit se donne les moyens légaux pour combattre les évasions fiscales. Haiti needs a minimum wage for the Haitian workers. Some people make less than $2 a day. Those people cannot afford to pay taxes. Haiti needs a minimum of at least $2 an hour so workers pay taxes. The Department of Taxation and Finances should get together with the Department of Labor in Haiti and the Economists in Charge to settle a minimum wage for the Haitian workers so they can pay taxes. Haiti needs some internal revenues to rebuild the country. Laurent Lamothe was bringing the country in the right direction with the Declaration d'impots.